These replacement seat covers are only for the Chevy Chevelle Convertible model for the 1965 model year. TMI Products include a limited lifetime warranty: cloth products include a 1-year warranty. These replacement Seat covers are for the 1965 Chevy Chevelle Convertible models. 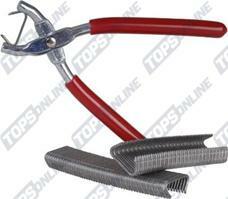 Manufactured to factory specifications and workmanship. 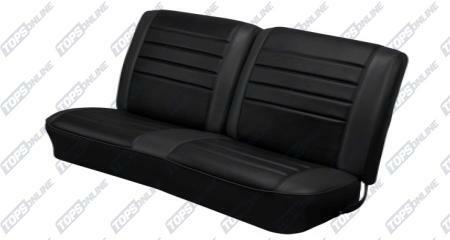 These replacement Vinyl Seat Covers and are the Full Set (Front and Rear) or Front Only for the 1965 Chevy Chevelle Convertible models with BENCH seats. These replacement Vinyl Seat Covers and are the Full Set (Front and Rear) or Rear Only for the 1965 Chevy Chevelle Convertible models with BUCKET seats. These replacement Vinyl Sport Seat Covers are the Full Set (Front and Rear), Front Only or a Front Only Kit for the 1965 Chevy Chevelle Convertible models with BUCKET seats. These replacement Vinyl Sport Seat Covers are the Full Set (Front and Rear), Front Only or a Front Only Kit for the 1965 Chevy Chevelle Convertible models with BENCH seats. 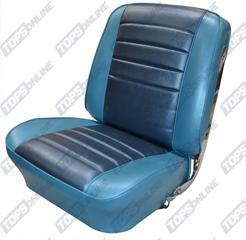 These replacement Vinyl Sport R Seat Covers are the Full Set (Front and Rear) or Front Only for the 1965 Chevy Chevelle Convertible models with BUCKET seats. These replacement Premium Vinyl Sport Seat Covers are the Full Set (Front and Rear) or Front Only for the 1965 Chevelle Convertible models. It is an upholstery set used to transform the dull, unsupportive factory 1965 Seats into the Sport X race style seats to keep you planted in those high G corners. These replacement Premium Vinyl Sport Seat Covers are the Full Set (Front and Rear) or Front Only for the 1965 Chevy Convertible models. It is an upholstery set used to transform the dull, unsupportive factory 1965 Seats into the Sport XR race style seats to keep you planted in those high G corners.